Hello and welcome to Exampundit. 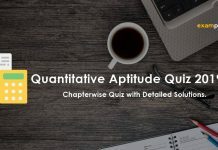 Today we have seen a new type fillers in IBPS Clerk Prelims shifts. 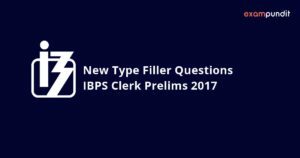 Since there are other shifts remaining, we have decided to provide you 2 sets of new type fillers from IBPS Clerk Prelims 2 December 2017. The two parties released a ………..press statement in the evening. Explanation: Joint statement by two parties is right expression. ‘Combined’ can also replace the ‘joint’. When the stock market ………….is negative .Funding, a critical element for scale, becomes a prized commodity. Explanation: Stock market has sentiment of investment. But not emotions. Trends in stock markets are also scaled or measured. Feelings can also fit. The powers of Centre appear to be a/an …………….on the powers of State Government. Explanation: Conflict of powers between two authorities is discussed where one is infringing/ crouching on the powers of other. The economy has been roughly ………for about two years. Explanation: Low economic activity is synonym to flat/down. The ………..before the board is that if it accepts his demand or not. Explanation: Board is at a point of making a decision but is in dilemma/confusion. Fear or threats do not adjust. Building reputation in market should be seen as a ……………….agenda for growth. 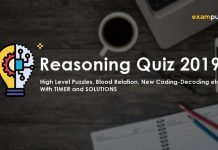 Explanation: Consistent or persistent both give same sense to the sentence. We seek a/an ………..for our daughter who is a divorcee and 34 years of age. Explanation: For marriage advertisement – match or alliance are perfect words. India has moved a step ……….to lifting the ban investments from Pakistan. 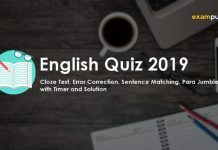 Explanation: Sentence hints for improvement of relationships so closer or near are correct fillers for the blank space. As Finance Minister steps in ,will the Economy …………..? Explanation: Sentence asks a question that intervention by Finance minister will bring what results for economy. Hence ‘step up’ or ‘step ahead’ are correct. Other options are not correct s the meaning differs completely. Lifting the ban from the investment from the long time enemy Pakistan will be a goodwill ………..